Exciting news! We’re upgrading our platform, with a streamlined user interface, new order form and some great new features. It’s a better experience, making it even easier for you to get the content you need, quickly. The navigation has been simplified to focus on five order types: Content, Editing, Translation, Strategy and Image, each with its own new navigation once you dive in. 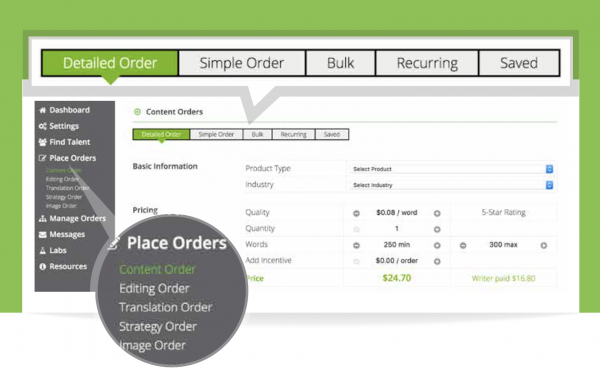 Click on Content Orders, and you’ll find a new Simple Order form that makes it a breeze to place an order with just the bare essentials. Great for mobile orders on the fly! For more complex orders, toggle over to the Detailed Order Form, to clarify your specifications and requirements. For just a few dollars more, you can order text for Twitter, Facebook, and LinkedIn posts to boost your content online. Plus and Enterprise Service customers can request a talent match. Your Customer Success Manager will hand pick the perfect writer(s) or translator(s) for your project. Plus and Enterprise Service customers can launch a writing contest that sends the same order to three writers. You pick the winner and we pay the other two writers (up to $100). Hire screened, professional Content Strategists to help you plan content, brainstorm topics, research keywords, manage the workflow and more. Find local, certified translators in 21 languages to reach audiences around the world. Just tell us when you want content, no need to indicate pick up time or review time. Rush service now also available. We know our streamlined interface, simplified order form, and new features will make it even easier to get the amazing content you need to help your business thrive. Do reach out if you have questions, need a demo, or would like to speak with one of our team members.